Dream Pod 9: Jovian Wars: Venus Kaminari Exo-Armor Preview & News! With Valentines Day less than a week away we wanted to show our Jovian Wars fans some love, after all the HGB Kickstarter posts. Our 3d modeler recently finished up the Kaminari exo-armor for the Venus faction of Jovian Wars, checkout the preview images below. Next week we'll be releasing the Jovian Wars: Venus faction Alpha Playtest pdf with datacards for all the exo-armor and fighter/bomber squads and all the planned new and remastered Venus spaceships. We'll run a small Jovian Wars: Venus Kickstarter this summer to get all the new resin spaceships and pewter exo/bomber squads made. 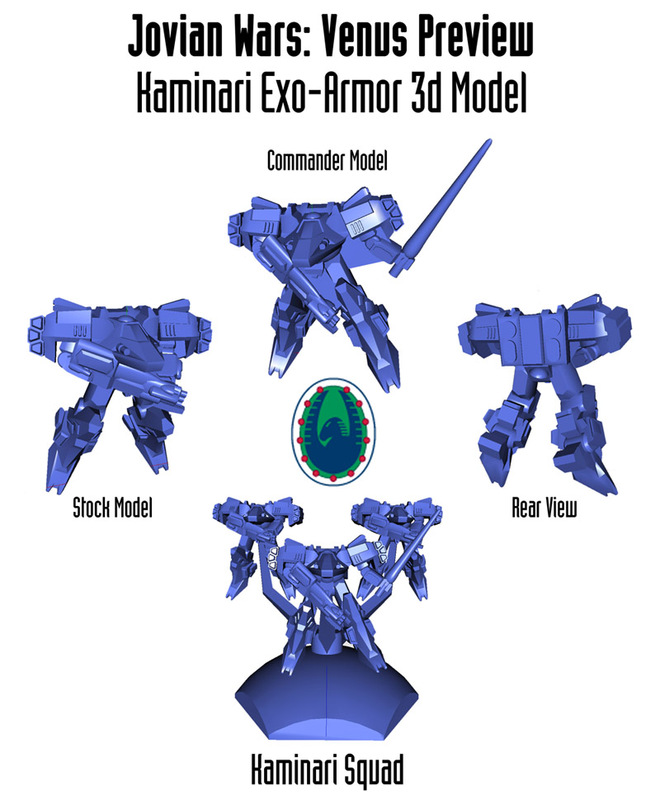 Home › Blogs › Robert Dubois's blog › Jovian Wars: Venus Kaminari Exo-Armor Preview & News!